Sam Holt and the Eisenhower Knights will compete in the D-10 Class 2A Section 1 Tournament Friday and Saturday. The winter sports postseason has arrived. The PIAA 2A District 10 Sectional tournament gets underway today in Union City and Warren County will be well represented as both Eisenhower and Youngsville wrestlers will compete. The top four wrestlers in each weight class will advance to the District 10 Tournament in Sharon Feb. 24. 106 pounds – Eisenhower sophomore Logan Jaquay comes in as the top seed after compiling a 26-3 regular season record and will square off with Fort LeBoeuf’s Mathew Orton (8-15). Youngsville’s Collin Clough (16-10) is the 4-seed and draws Corry’s Lucas Munsee (12-12) in the opening round. If both Jaquay and Clough win their opening match, they’ll face each other in the semifinals. 113 pounds – Eisenhower’s Easton Hedman (21-5) is the 3-seed and will open the tournament against Youngsville’s Dustin Phelps (11-14). 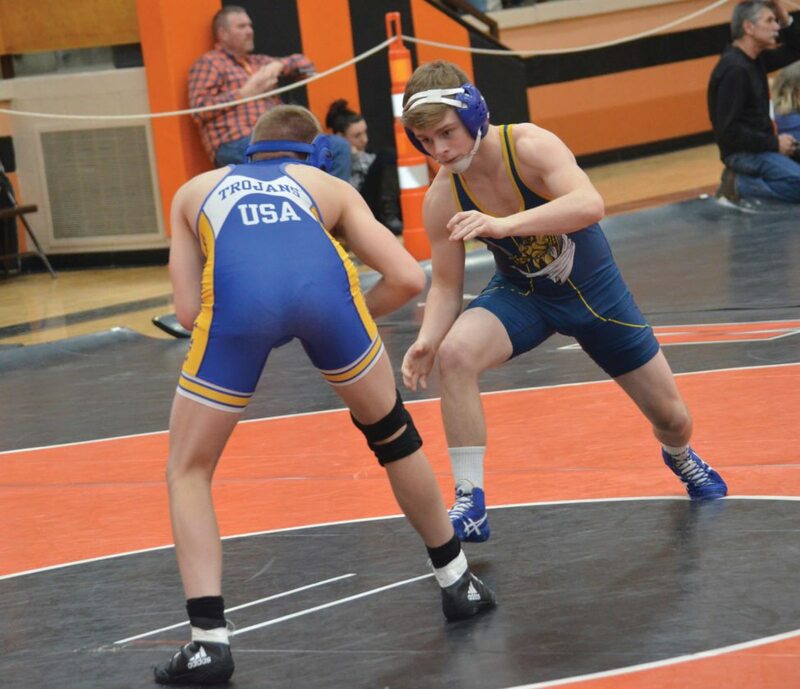 120 pounds – Freshman Knight Jake Williams (12-15) faces a tough challenge as the 7-seed drawing Harbor Creek senior Mike Gabler (26-8), the 2-seed. 126 pounds – Josh Bortz, the 5-seed, from Eisenhower and Jayson Soliwoda, the 4-seed, from Union City bring identical 13-9 records into their quarterfinal match. Soliwoda dropped all the way to 113 when the Knights and Bears squared off at Eisenhower. 132 pounds – Youngsville freshman Alex Greene (3-14) might have the most difficult quarterfinal matchup of the Warren County contingent. He’ll face Harbor Creek senior Sam Sallot, who has only lost twice on the season (35-2). Eisenhower’s Nate Holt (16-16) will meet a familiar foe in North East’s Garrett Kopp (24-4). Kopp earned a third period pinfall win over Holt when the two met earlier this season. 138 pounds – In one of two 16-wrestler brackets, Youngsville’s Mik Fehlman enters as the 7-seed and receives a first-round bye. He’ll meet North East’s Dylan Muscarella (16-8) in the quarterfinal round. Eisenhower’s Sam Holt (17-10) comes in as the 3-seed and will face Saegertown’s Colten Beck (13-10). Beck pinned Holt in their regular season meeting. 145 pounds – Eisenhower gets its second 1-seed as Garrett Head (25-6) opens against Saegertown’s Matt Posego (5-20). Head earned a pinfall victory during their dual match meeting. Youngsville’s Aaron Morris (20-7) is the 3-seed and squares off against Seneca’s Josh Farmer (18-9). 152 pounds – Eisenhower’s Spencer Head (25-3) will look to defend his sectional title in the second 16-wrestler bracket. He gets a first-round bye and will face the winner of the 8-9 matchup between Iroquios’ Andrew Kightlinger (3-10) and Youngsville’s Michael Haehn (0-13). 160 pounds – After missing a big chunk of the season, Eisenhower’s Alex Barnett came on strong late and earned the 4-seed with a 13-5 record. He’ll face Corry’s Matt Petrilla (15-9). 170 pounds – Eisenhower’s Ethan Chambers (13-15) enters as the 5-seed and squares off against Fort LeBoeuf’s Jacob Lloyd (15-11). Lloyd wrestled at 160 when the teams met in the regular season. 182 pounds – In the 7-2 matchup, Youngsville’s Sam Hoover (2-21) will tangle with Fort LeBoeuf’s Julian Gorring (20-2). Eisenhower’s Justin Hagberg (15-15) takes on Seneca’s Mike McCurdy in the 6-3 contest. If both were to win, they would face each other in the semifinals. 195 pounds – Youngsville’s Jake DeSimone (3-4) faces Iroquois’ Draven Douglas (20-6) in the 7-2 match. The Knights’ Matt Huling (21-10) is the 3-seed and draws Union City’s Nick Kaday (5-4). Kaday did not wrestle when the two teams met in the regular season. Again, if both County wrestlers were to advance, they would meet in the semifinals. 220 pounds – Eisenhower’s Joey Bauer (23-8) is the top seed and has a bye into the semis. He’ll meet the winner of the match between Shawn Proctor (16-14) of Corry and Union City’s Tyler Hedderick (19-8). Bauer has a win over Hedderick this season. 285 pounds – Youngsville’s Mason Benjamin (18-9) comes in as the 3-seed and draws Fort LeBoeuf’s Lance McLaughlin (4-14) in the quarterfinals. Wrestling will begin at 5:30 p.m. with the prelims. The quarterfinals and first round of consolations will follow with the semis and second round of consolations starting at 10:30 a.m. Saturday. The tournament will conclude with the consolation finals and championship matches beginning at 6 p.m.